A man driven by enormous ambition, William Byrd II of Westover was an exceptional figure in colonial America. Educated in England, he developed refined tastes there and on the Continent through broad exposure to art and architecture. His London friends were distinguished, and they brought him into the presence of such notables as the daughter of the duke of Marlborough and even King George I. Byrd collected eight treatises on painting and thirty on architecture, part of his sizable library of 4,000 volumes. Certainly no figure in colonial America was more culturally advantaged. 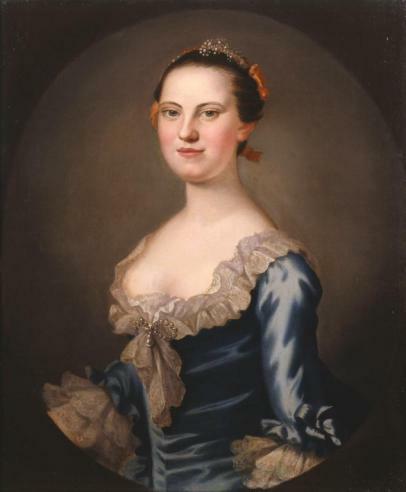 Byrd amassed a portrait collection that was unmatched in colonial America in quality, quantity, and theme. It included canvases by accomplished English masters, and it grew to total thirty portraits, a size vast by colonial or even modern standards. The majority of the Westover portraits were commissioned when Byrd lived in London, between 1714 and 1726. Many of the sitters were not family members but instead London figures he either knew or wished to know. On his return to Virginia, Byrd owned more paintings than most colonial buildings could accommodate. He hung most of them in his library, a separate building at Westover that flanked the main house, to the west. It functioned in the English tradition of library gallery, a room containing books by and portraits of notable persons whose achievements could inspire ambition and emulation.